Last weekend I had the good fortune to ride the AERC National Championship 100. It was the second time that my horse has toed the line with Heraldic in a 100-mile event, and it was the second time that we were left in the dust at the start. I am not sure that either Frank or Heraldic really cared, but it is certainly something special when you can run the very same course at the very same time with some of the very best in the sport. I do not know of many other activities that afford that opportunity. I cannot play golf with Tiger Woods, Frank cannot enter the Kentucky Derby, and as a team, the most equine events are out of reach for us. But, when the AERC National Championship came to our region, we qualified and ran with the best. The 2007 National Championship was truly a first-class event. 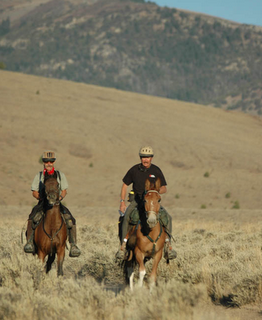 Steph and John went out of their way to host two exceptional rides. The trail over Toy Mountain is one of my favorites and coupling the mountain trail with the desert loop to the Sierra del Rio Ranch made an honest 100-mile course with plenty of variety. On the Toy Mountain loop just before the descent in front of Quicksilver Mountain, you can look out across the desert vista and see Fossil Butte, the Snake River, and the canyon location of the Sierra del Rio Ranch -- all of which are on or near the 100-mile trail. All those landmarks appear very far away and the distances will "mess with your mind." The trails, the local vets, the AERC vets, the foreign vets from South Africa and Malaysia, the riders, the horses, the volunteers, the caterers, the band, and especially the hosts were all exceptional and it was a weekend to be remembered. Steph and John know how to throw a party. The band was composed of Owyhee County locals plus some other real cowboys from elsewhere in SW Idaho. After a few blown circuits and electrical adjustments, we danced under the moon on the deck until late Thursday evening. On Friday, the lyrics to the slightly altered Lynyrd Skynyrd song "Sweet Home Oreana" were still running around in our heads. On Friday we socialized, shopped, and attended clinics on conditioning, pacing, and shoeing. We packed our saddle bags, walked and fed our horses, and bided our time until the civilized 6:30 AM start Saturday morning. All day Saturday I rode with my friend Max Merlich and Junior, his 100-mile mule who would be right at home on the Outlaw Trail. We set a reasonable and measured pace designed to get us up and over the mountain and across the desert to the finish. Over Toy Mountain, down the old stage wagon road, through the desert lands at dusk, and then along the desert trails under the stars at night, we rode along at steady, even pace designed to take us through 100 miles of tough trail. At 92 miles Frank's exit CRI was 48/48 -- the day had been hot but the pace was effective. We were not the first across the line, in fact, we were almost the last, but we rode our own ride and lady luck chose to ride along with us too. It was a great day followed by a spectacular night under a big desert moon. The AERC National Championship travels around the US, as it should. If the National Championship is ever held close to your home, be sure to attend either as a rider or as a volunteer. I do not know if I will ever get the chance to ride another National Championship 100 and Frank is at least seventeen so I doubt that I'll get the chance to ride another NC 100 with my horse Frank. Saturday was a day of memories.